All major social networks in 1perfect solution. Add Facebook, Twitter, Google+ , Vkontakte, Windows Live, Linkedin and more Login buttons with one module. 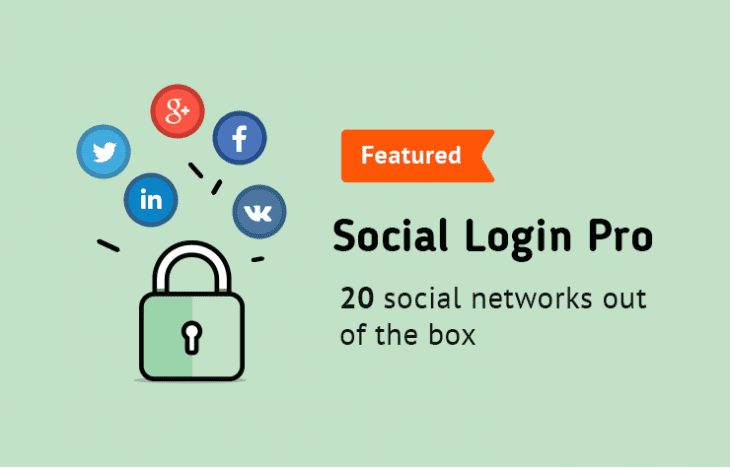 You get all the popular social network login buttons in one single module and flexible configuration options. You can choose from 5 different styling options: icons, small, medium, large and huge. You can sort them the way you like. Social networks usually share just the email and the name. With “Social login” you can ask the customer to enter his phone number, address, country or a password – you decide. You can even set the background of the pop-up screen. You can place the login buttons anywhere in the shop using the built-in positions and layouts of opencart. If you have extra positions, they will work great together. Ever social network provides an app feature – our detailed instructions will guide you through the process with ease. Check the checkbox for the button you want, select the positions and layout and you are good to go. You can set the forwarding page after the customer signed in for the first time – to complete his registration from the profile page or fill in his address – makes it a lot easier for everybody.